Anderson was optioned to Triple-A Lehigh Valley on Tuesday. Anderson's stay on the big-league roster lasts just a single day. 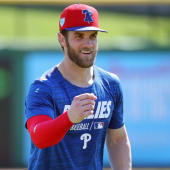 He didn't do anything wrong in his lone appearance, striking out two and walking two in two scoreless innings, but the Phillies need fresh arms in the bullpen after back-to-back extra-innings contests. Jerad Eickhoff was recalled in a corresponding move.